s we try to show you the most worth-to-see stuf from all computer categories today we are going to take a look at a machine that is perfect for home use.. Entertainment, movies, music, browsing, anything that will keep you amused and help you get your work done… This video review presents Asus X55VD. The machine is very well built, it has a nice textured plastic case but is quite bulky and a little heavy too, around 2.2kg. The 15.6’’ diagonal screen makes it perfect both for entertainment and work as well. The LED backlit screen works in 1366×768 pixel resolution and at a pretty good brightness level. However, we were not very happy with the glare surface of the panel. The hardware component responsible for the smooth visual performance here is Nvidia GeForce 610M with 1GB DDR3 memory. 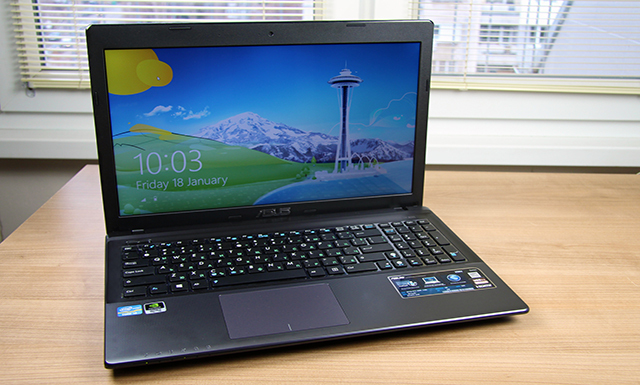 Let’s see what else this Asus notebook offers. Of course you can find this machine in different configurations when it comes to CPU, RAM and hard drive storage, but our test sample featured the following hardware specifications. The machine came loaded with IntelCore i3 processor working at 2.2GHz frequency backed by 6GB of RAM. The user memory available to save your data is 750GB at 5400rpm. The Asus x55VD features an Instant on technology that wakes up and resumes the machine from sleep mode in just a few seconds so that it is always there ready and waiting for you. The brand new Windows 8 platform is at your service here, updated real-time and offering you one-click access to anything you are interested in, it is one of the most flexible operating systems. Along with the other features the machine also offers a built-in 0.3 MP webcam, as well as a DVD Super Multi drive. The Asus Ice Cool technology keeps the notebook cool and prevents overheat even when working from your lap. The connection with other devices is established by the fast USB 3.0 port, an HDMI and a VGA port as well. It is also equipped with a card-reader. This notebook sounds pretty good, as it features an Altec Lansing sound system. The island-style keyboard and the touchpad are very responsive and comfortable to use, they work very well with the Windows 8 platform. When unplugged, Asus x55VD works with a 6cell 5200 mAh battery.